This entry was posted in Blog Uncategorized on March 7, 2016 by Lauren Pearson. Cross-Posted from the Global Urban Humanities Initiative Blog (link to original article here). How do bodies construct and inhabit public space? 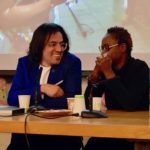 In the past week I had the opportunity to participate in three transformative workshops—two sponsored by the Global Urban Humanities Initiative–that used dance, movement, and mindfulness to explore public space. In a narrow, high-sided concrete courtyard hidden in an outdoor corner of the Brutalist Wurster Hall, Kinan Valdez of Teatro Campesino asked students and faculty to growl and shout; to walk, crawl, and leap; and to engage with props such as ropes and lampshades to reconsider the uses of discarded objects. The “Theater of the Sphere” practice of Teatro Campesino grows out of the company’s roots in Cesar Chavez’ United Farmworkers Union. In the 1960s, Teatro Campesino performed and engaged with workers on flatbed trucks and in union halls, and the company continues to create innovate theater today. 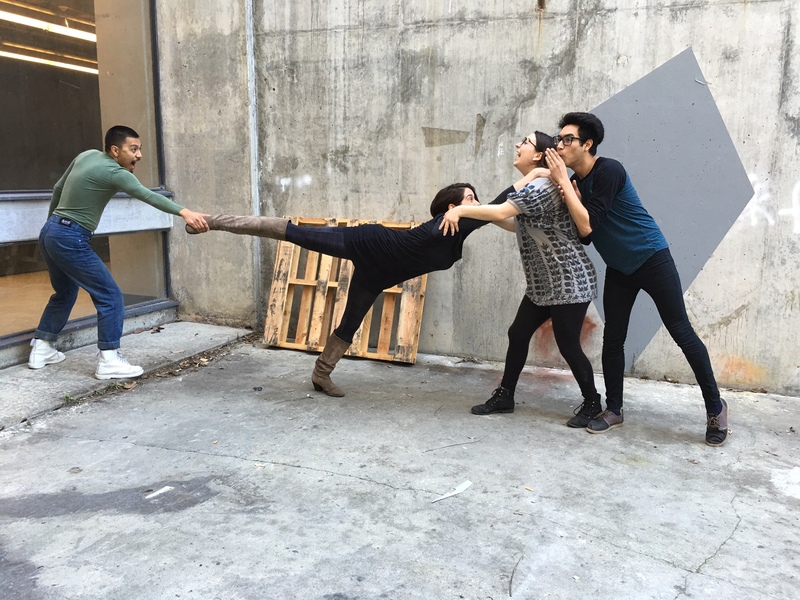 Assistant Professor Angela Marino (Theater, Dance & Performance Studies) had invited Valdez to help prepare students for a research studio trip to Mexico City, where they will investigate issues of materiality, performance and power in a fast-changing megacity. During the workshop, we were struck by how our individual and collaborative motion in the confined gray courtyard transformed a prison-like space of raw concrete into an almost cozy enclave, a home for shared experiments in how bodies relate to architectural space. In March, the students will travel to Mexico City to pursue research projects ranging from the ethnographic to the artistic, led by Marino, Assoc. Prof. C. Greig Crysler (Architecture), and Prof. Maria Moreno Carranco of the Universidad Autonoma Metoropolitana-Cuajimalpa. As with all Global Urban Humanities courses, the group is interdisciplinary and includes students from disciplines including architecture, art practice, film, geography, literature and performance studies. Another group of students explored a very different space two days later. The vast, windy courtyard of the Civil War-era Fort Point was the setting for a workshop led by Ava Roy, artistic director of We Players. Roy has presented large-scale, site-integrated theater including Hamlet at Alcatraz, The Odyssey at Angel Island,The Tempest at the Albany Bulb, and several different stagings of Macbeth at Fort Point. Located at the southern base of the Golden Gate bridge, the massive brick fort encloses a concrete courtyard with three stories of arched galleries that once held huge cannon pointed out at potential intruders into San Francisco Bay. Roy asked the students to explore the space with eyes closed and open. The rumbling of cars overhead on the bridge, the wind, and the crashing waves outside made for an acoustically unsettling, even threatening environment. As students tried to distinguish softer sounds, and ones closer and farther away, they discovered aspects of the space they had not considered. Roy explained how in her stagings of Macbethshe experimented with moving the audience and actors through the galleries, the courtyard, and the roof, employing musicians as pied pipers. She served real food at an enormously long table in the banquet scene to rejuvenate the audience on their strenuous journey up and down the stone staircases—and arranged for them to find their repast interrupted by Banquo’s ghost. Participants said they were struck by the craftsmanship and complexity of the brickwork in the vaulted galleries of the fort, by the accidents of light, and by the surprising current uses of the space. Despite the frigid and foreboding atmosphere of the Fort, on this day it was filled with professional photographers shooting smiling clients in evening attire or high-fashion maternity wear, using the steel undergirdings of the bridge and the carceral military architecture to frame family celebrations. The architects and city planners participating in the workshop said that Roy’s instructions in ways to maintain a soft gaze, to de-privilege the sense of sight by sharpening hearing, touch, and smell, and to be mindful of bodily sensations were a useful alternative to their usual analytical tools for considering public space. Landscape Architecture student Jason Prado reflected on what he learned here. Anna and Lawrence Halprin were pioneers in the 1960s in combining dance and environmental design to understand and build spaces both public and private. Halprin was one of the most influential American landscape architects of the last century, responsible for both Sea Ranch and Sproul Plaza, among many works. 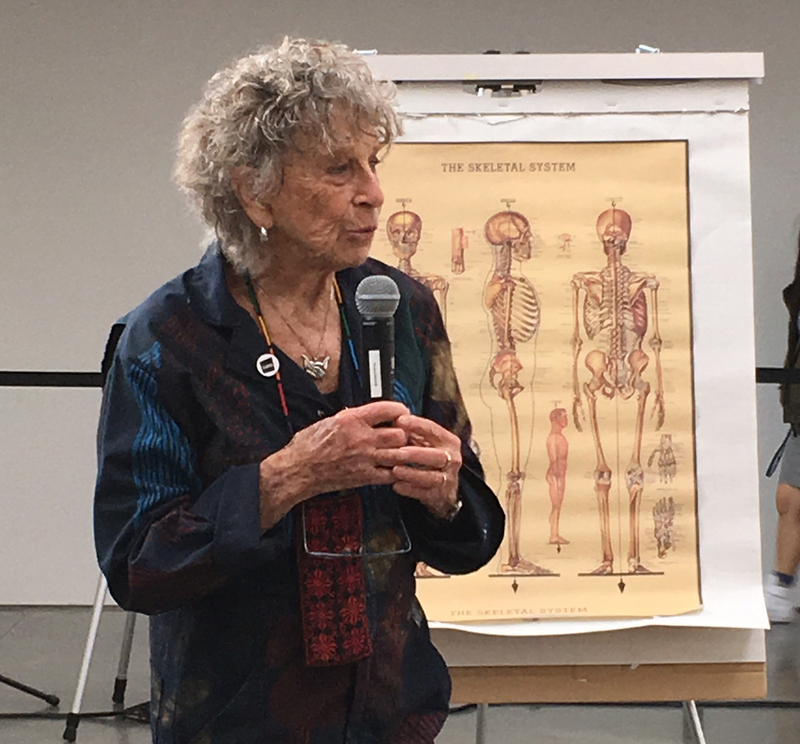 He passed away in 2009, but at age 95, his wife, choreographer Anna Halprin still teaches dance and movement at places including the iconic deck of their home in Marin County. 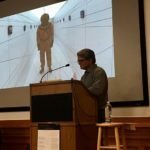 On Sunday, she led a workshop in the wide-open Crane Forum of the new BAM/PFA museum in downtown Berkeley in association with the Architecture of Life exhibition. While her collaborator Dohee Lee provided rhythmic sounds breathed into a microphone, (fascinating small children who happened to be passing by) Halprin worked with participants to build a “score”—a set of broad instructions for directing movement, developed in an iterative conversation among Halprin and the participants. The giant wooden steps of the Forum and the airy spaces of the museum provided a far gentler space than either the Wurster Hall hidden courtyard or the cold massiveness of Fort Point. But like those spaces, it provided an acoustic, visual, and haptic container for people’s investigations of the relationship of their bodies to space, to other people, and to the memories embodied in architecture designed for pedagogy, surveillance, or the display of art. The experiments of the Halprins in are chronicled in a current exhibitionat the California Historical Society, which documents the development of their RSVP Cycles method of creative collaboration. The Architecture of Life is also a course taught this semester by Global Urban Humanities Initiative faculty members Prof. Shannon Jackson and Assoc. Prof. Nicholas de Monchaux, which features public lectures. As a springboard for the Chancellor’s new Arts+Design Initiative, which is headed by Jackson, the exhibition and course explore interdisciplinary approaches to cities and space that dovetail with Global Urban Humanities experiments. Building on traditions like those pioneered by the Halprins, for the past several years, the Global Urban Humanities Initiative has been harnessing dance and movement as a way to investigate space and inform the design of buildings, parks, and public spaces In Spring 2015 urban designer Ghigo di Tommaso and choreographer Erika Chong Shuch taught an interdisciplinary course called Public Space: Placemaking and Performance that explored theories of public space through physical experiments including interventions such as inviting Costco shoppers to participate in listening to the concrete floors of the store or setting up cardboard “people” for passersby to engage with in downtown Berkeley. The nature of these bodily experiments tends to be iterative and cumulative rather than conclusive. 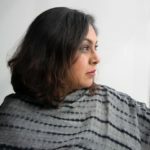 Their value will need to be measured in the ongoing work of the designers and scholars who are developing new cross-disciplinary tools for interrogating space and place. ← ARC | Arts + Design welcomes Susan Miller!